Most of you know that I express my passion for design as both as Design Journalist and a Decorator. I’m always on the hunt for the latest looks and trends to keep you up to date on the ever-evolving world of style. When it comes to my personal home, I try to stay current and contemporary without being too trendy. Yes, we all know that home decor typically requires a refresh after 10 years because looks go in and out of the style. The Mediterranean/Tuscan inspired interiors of the 90s and early 2000s with their faux finishes and heavy-handed embellishments gave way to today’s lighter, streamlined styles. Not everyone is a fan of modern decor. I get it. For me, I want a clean, uncluttered space that feels like I can breathe. I like simple and serene. With this in mind, I invite you on a tour of my personal residence. 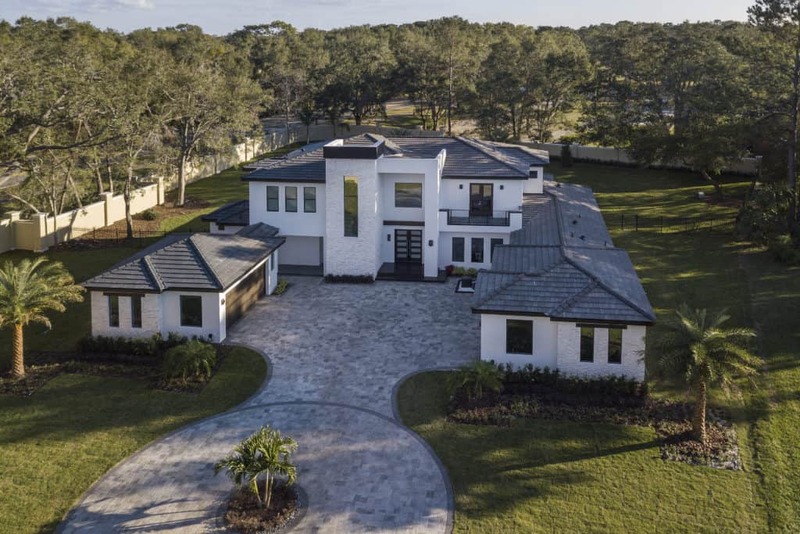 A Florida modern home that reflects its regional vernacular: slightly pitched rooflines that appear flat from the facade with geometric angles and elevations embracing touches of wood and stone. Inside, I choose a color palette of white and grey with pops of blue to keep the spaces from swaying too monochromatic. Although my decor is decidedly modern, I didn’t want my rooms to feel cold and sterile like white-box museum space. 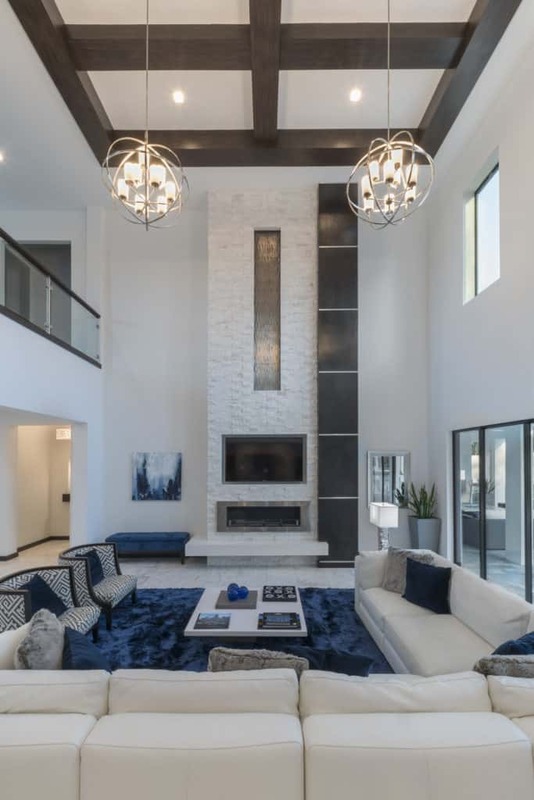 The living room of The Design Tourist’s home features marble floors with grey veining, a 24-foot fireplace clad in white ledgestone and a custom crafted wood column with steel bands. The fireplace mantle has a cantilevered ledge of white quartz. The Design Tourist added a dose of cobalt blue with the shag rug and pillows mixing in textures of faux fur, leather, stone and wood. I have a formula that I use to decorate my rooms: Texture + Color + Metallic+ Organic =Timeless Decor. Every room should speak to the senses with fabrics pleasing to the touch, plants that ground us in nature, metallic accents to bounce light and brighten the space and natural materials such as wood or stone for timeless appeal. 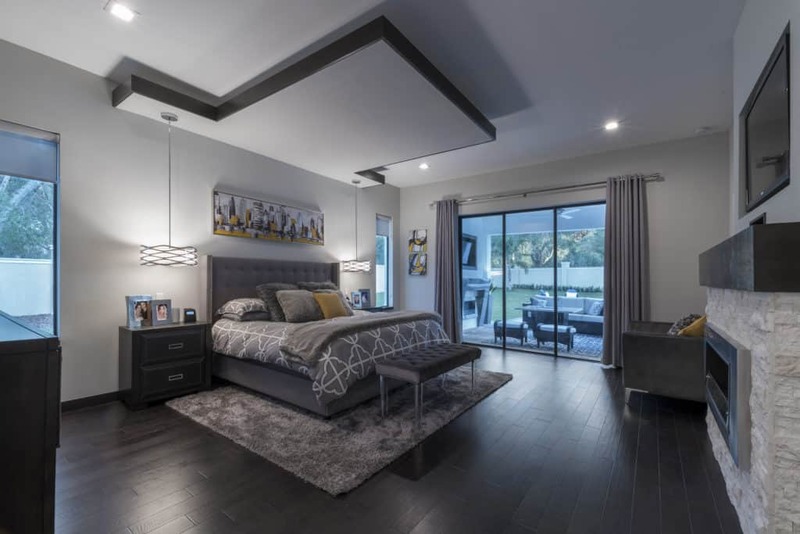 The Design Tourist’s personal home features a master bedroom that incorporates her design formula: Notice the doses of metallic with the hanging pendants on either side of the bed and the stainless steel fireplace. Texture comes from the grey shag rug, faux fur accent pillows and blanket that complement the natural wood floors. 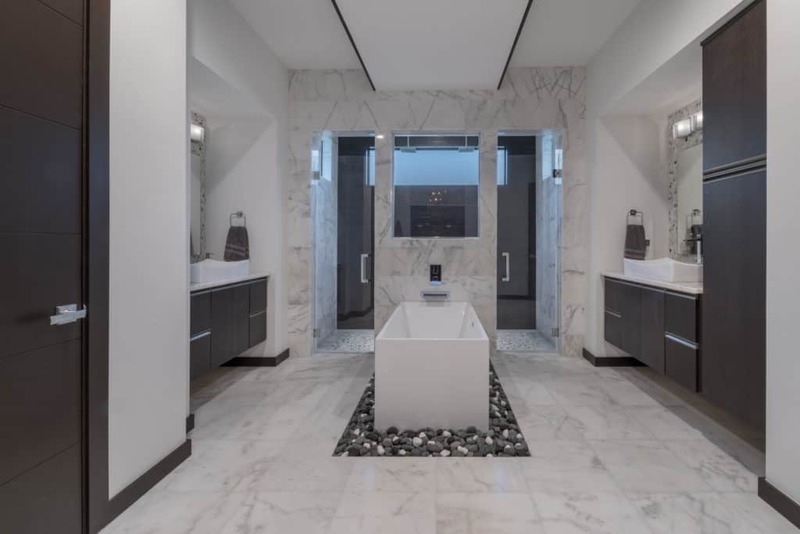 The master bathroom in The Design Tourist’s personal residence draws inspiration from boutique hotels with a zen/spa-like ambiance created with natural elements including a bed of river rocks below the freestanding tub and porcelain shower tile that mimics the look of espresso wood used throughout the home. I don’t think you should be beholden to trends but I do think you can use trends as a springboard to create your own style and draw inspiration. I weave in trendier elements with pillows, accessories and lamps. 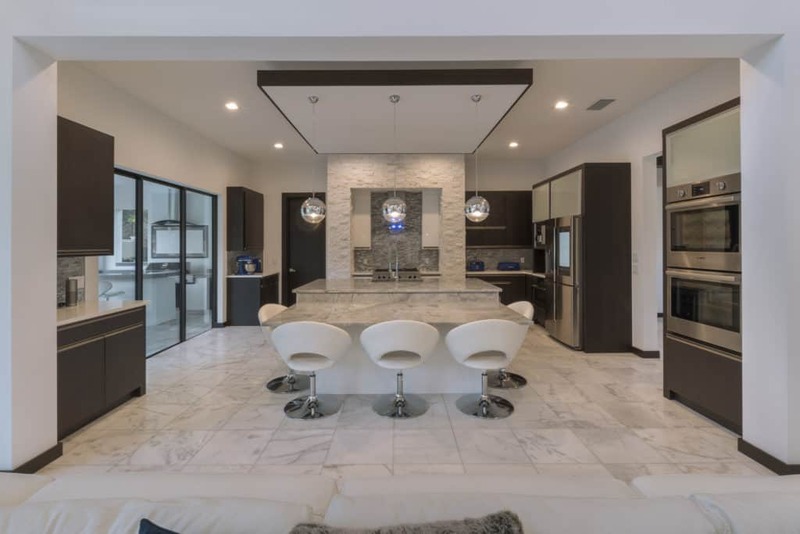 The grey and white color palette in The Design Tourist’s kitchen plays with metallic accents including the silver glass tile backsplash that bounces light around the kitchen, chrome globe pendant lights, stainless steel appliances and chrome framed frosted glass upper cabinets. The quartz countertops around the perimeter of the kitchen and the quartzite double kitchen island give the space a contemporary feel that is grounded by espresso wood cabinets. Light fixtures add a sculptural presence and are more cost effective to replace in tandem with the latest looks as opposed to entire suites of furniture. 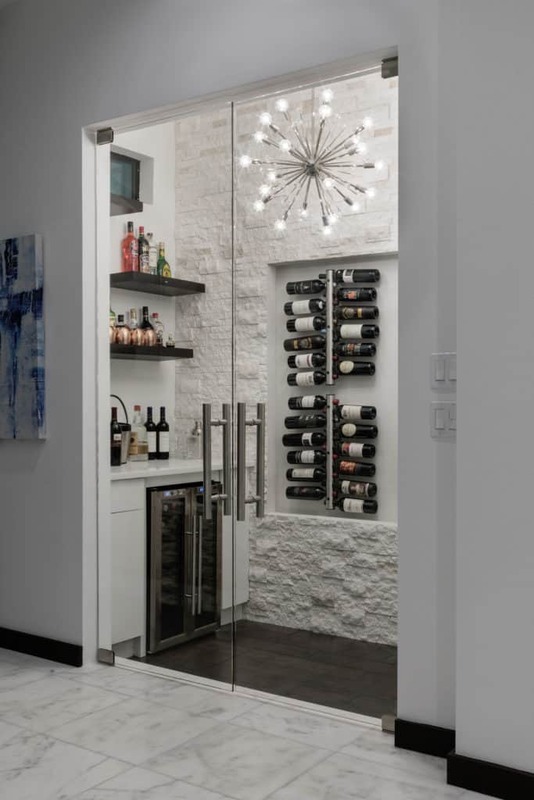 The wine room in The Design Tourist’s personal residence draws the eye to an on-trend “Sputnik” light fixture. 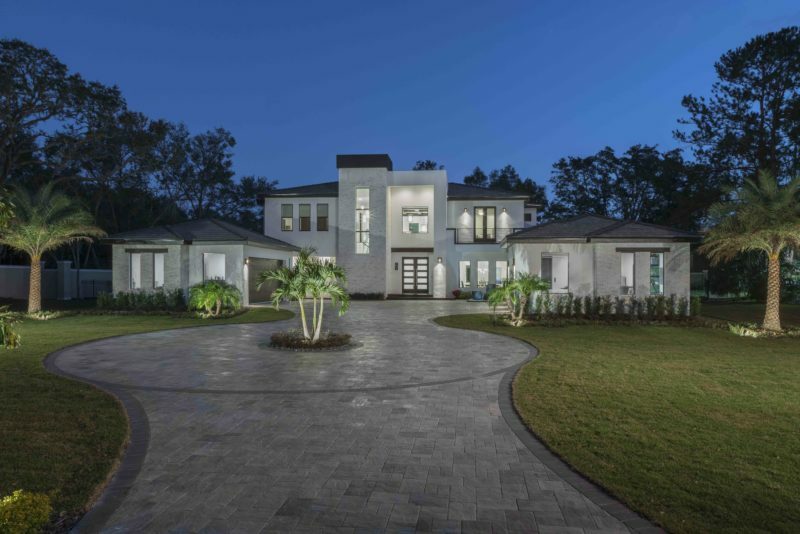 The wood floors and white ledgestone wall echo the home’s central design details. 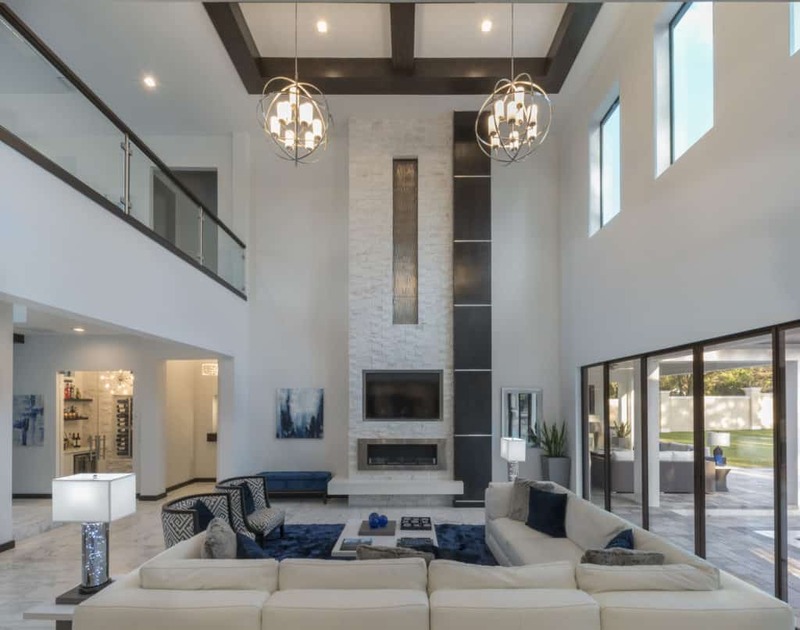 The living room of The Design Tourist’s Florida Modern home features two large globe lighting fixtures that fill just enough space in two-story room without overwhelming. The white sofa sectional visually defines the perimeter of the living space. My main living spaces are 24 feet high which presents a challenge with scale. Scale is a tricky concept in living spaces but makes the difference between a so-so and a stellar space. Scale is a subtle thing; it’s subjective yet essential to creating a space that is beautifully proportioned. The glass and wood staircase in The Design Tourist’s personal home features espresso wood handrails with chrome supports and marble stairs with mitered wood cladding on the sides. 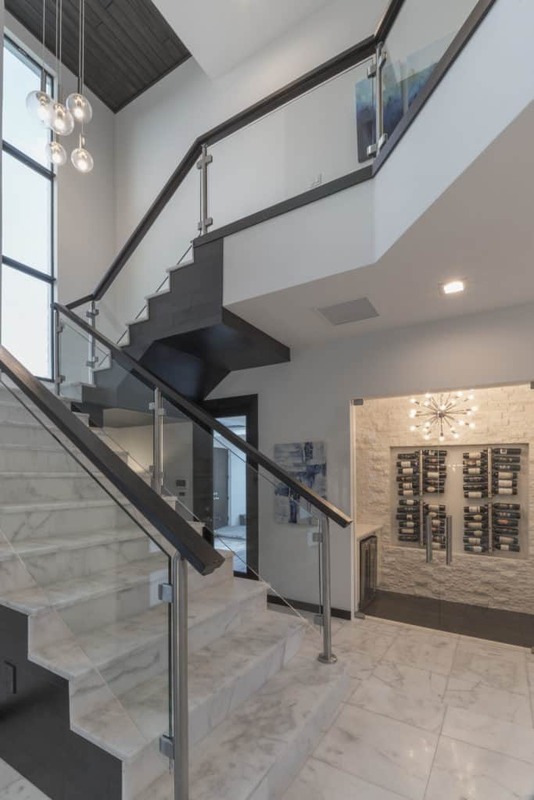 Glass and translucent materials such as acrylic allow spaces to visually breathe which is why I designed a glass-paneled staircase with espresso wood railings and added acrylic home decor accents. For more of my home’s design details, I invite you to check out this video tour of The Design Tourist’s residence filmed with the builder, Jorge Ulibarri, owner of Jorge Ulibarri Custom Homes.